A dream concert featuring five of the country's top female singers will be happening in November this year. Yep, you read that right, FIVE. Okay, quit guessing which five divas would agree to hold a major concert together. They are none other than Yeng Constantino, Rachelle Ann Go, Angeline Quinto, Kyla, and KZ. 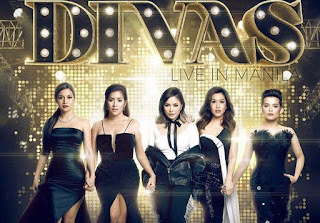 Each of the five divas can hold a concert on their own, but someone in Cornerstone Entertainment Inc.came up with the brilliant idea to put them all together in a grand concert titled "DIVAS Live in Manila". The divas' rendition of Beautiful by Christina Aguilera during their press conference, gives one a peek on how they will perform onstage. With that one song alone, you can expect a night of spectacular vocal showmanship that will blow you away and leave you shouting for more. Yeng Constantino said that since they have different genres, the collaborations among them are more exciting. Angeline Quinto is thankful that she will be performing with four talented divas since it will be a great help to her career. Rachelle Ann Go said that she miss having a concert, since she has been out of the country for quite some time. She added that it's an honor "to share the stage with these talented women of the Philippines". She is expecting the concert to be "epic". Kyla said that aside from working with talented but very humble artists, she is also looking forward to the gathering of their fans at the concert venue. KZ said that it will be the first time that she will really be part of the main act or headliners of a concert and not just as a guest. She considers their upcoming concert to be a milestone in her 4-year old career especially since she will be with artists who she just used to watch. It was obvious during the presscon that the five divas like and respect each other. They also admire each other's talent, which is quite refreshing, considering they belong to an industry where competition is stiff. Being friends for real, the five divas don't mind how the billing will come out. They don't really care about that. What they want to focus on is to give a good show and to give the audience their money's worth. With five divas in one concert, how can the audience feel shortchanged?